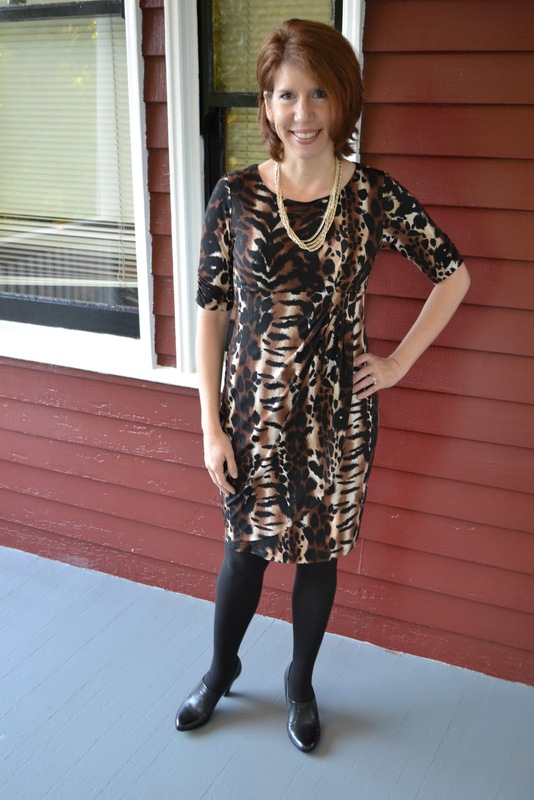 Paralegal Career Dressing: Animal Print Mash-up? After I posted “How to Wear Snakeskin to Work,” a reader asked me via Practical Paralegalism’s Facebook page if I’d really wear an animal print to work. I asked one of our associates if this dress is too “RRAAAHHRR-errrrr” (I don’t know how to spell that sound), and she said, “No, I love it. It has a great silhouette and details. But it wouldn’t work if it were shorter.” I replied I’m pushing 50 and don’t do much shorter. I do love the empire waist, and the clever tucks and draping, with the slight ruching on the sleeves – all of which make this a great dress for the office. Plus, it’s as comfortable as a nightgown, which is important to me. This is just my opinion, but I think when you do go with a strong print, you need to minimize your accessories, so that you don’t have too much going on at once. But here’s the real question: What de heck animal is this? We decided it was several animals – plus some that don’t exist. Do you have any animal print clothes you can wear to the office?